AshleyNewell.me: How Cute is THIS?!? I don't have a project to show you today but I do have this AMAZING picture of Parker that my friend Amy of Amy Leigh Photography took. After our last family session, I realized that I still needed some just in diaper pictures of Parker before he lost his adorable chubbiness. So, we did another session. This is my very very favorite of the whole session. Look at my boy's sweet face! Don't you love him?! I certainly do. He's gonna be one next week. I can't believe how fast this year has flown by! ADORABLE Ashley! He can't be one yet! OMG! He is a cutie! Wow...one already! Where did the year go?! It all goes by so fast doesn't it? Such an adorable picture! OMW, this made me squeal in delight! What a sweet keepsake! SO cute! 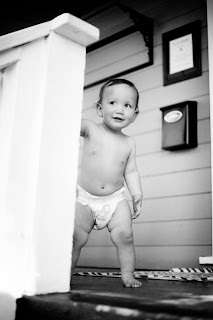 I can't believe he is going to be one- I was thinking about that the other day! It seems like yesterday you found out you were pregnant! Yikes! Time if flying by so fast! HUGS!! This picture of Parker is just priceless. Love this picture Ashley! I would love to get some nice photos done :) usually its me doing them with the timer on the camera and we all run to get into postition ha ha quite funny actually!